If you run a school, hospital, business or any other commercial endeavor that requires employees to climb a set of outdoor stairs in order to get into their office building, then a stair climber chair is your best bet. The Indy PRO Outdoor Stair lift is weather resistant, reasonably priced and easy to maintain. This stair lift mounts to the stairs instead of the wall. The seat swivels 90 degrees towards the landings at every level for incredibly easy entry and exit. There are safety sensors to stop the lift in order to avoid stalls or if something is preventing the lift from operating properly; this lift can be installed on either side of the staircase. It also comes standard with the following: a weather-tight component cover, a weather-tight header cover, along with a weather-tight seat and unit. The Indy PRO Outdoor Stair Lift makes accessibility to the office possible in rain, sleet, snow, or extreme cold. For a disabled employee, with a need to traverse a set of outdoor stairs, the aforementioned all-weather stair lift is a perfect solution. Another great stair climber chair that is becoming increasingly popular is the Indy Pro XL Lift. 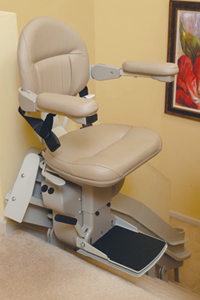 This lift can safely transport an industry best of five hundred pounds; it has a maximum travel distance of an astonishing forty feet, a heavy duty seat, an arm and foot rest frame, an easy to use integrated constant pressure control switch, a 90-degree swivel at both upper and lower landings; and it is non-handed for easy change to right or left side configuration. The Indy Pro XL lift comes with a multi year warranty. It has been safely installed and used many homes across America. Contrary to popular belief, stair lifts are safe and affordable. Most of them come with warrantees, expert customer service and in depth instructional guides.